Fishing in October was great with live bait all over the place fishing charter actionhas been red hot . The Redfishng this month has been excellent . A lot of the fish we have been catching have been in the 5-10 lb range . The bait that we have been having the best luck with have been a live pilchard under a popping cork. 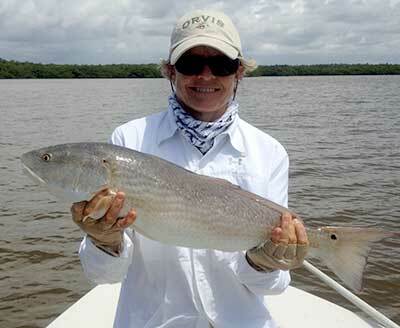 Mix in with the Reds have been nice size Snook that have been making a great come back from the freeze 3 years ago . The Trout fishing has also been good this month . With the water temperature dropping into the the mid 70’s the trout have been all over the grass flats in 3 -5 ft of water . The bait we been have the best luck with this month have been a live pinfish under a popping cork or a rootbeer jig tip with shrimp. Pompano has also been showing up this month . We’ve been having or best luck on the high tides and using a 3 inch tube jig .Most of the pompano we have been catching have been in the 3-5 lb range. I would like to thanks you for checking out my website and if you would like to book a trip please give me a call. Call NOW for my unbeatable rates! Sign up for the latest fishing reports, tips, photos, and discount offers. Copyright © 2007 - 2012 Fishing The Everglades. All Rights Reserved.